Does it bother you that Obama’s Secretary of the Treasury is a documented tax cheat? Does it bother you that Charles Rangel, the Chairman of the House Ways and Means Committee who wrote our nation’s tax laws, is a big time documented tax cheat? If you answered “no,” you are a Democrat. And a hypocrite. It is amazing how many wealthy Democrats there are – both in elected or political office and in the private sector – who think high taxes are great, and then do everything they can to avoid the very high taxes they want everyone else to pay. What follows is a demonstration of the fact that Democrats want to shelter government employees – who are paid with YOUR money – from being responsible for the legitimate consequences which should follow from working for the very government you are screwing. Why would the Democrats take such a repugnant stand? Two reasons: 1) Most government employees are unionized; 2) these unions support and work for Democrats. A legislative compromise that would have allowed agencies to fire tax-delinquent federal employees fell apart on Thursday. The compromise softened an amendment to the 2009 Contracting and Tax Accountability Act that Rep. Jason Chaffetz, R-Utah, introduced earlier this week. The act already would prohibit companies that don’t pay their taxes from winning federal contracts; Chaffetz’s amendment extended that principle to “seriously delinquent” federal employees and congressional staffers. Modified language that would have provided federal employees with due process protection and a hardship exemption won support from House Oversight and Government Reform Committee Chairman Edolphus Towns, D-N.Y. But, Rep. Stephen Lynch, D-Mass., chairman of the Oversight and Government Reform subcommittee on the federal workforce, and other Democrats, said the compromise amendment still was unduly harsh because it defined delinquency as the issuance of a lien by the Internal Revenue Service, which could be an early stage in resolving a tax dispute. Chaffetz, however, argued that the amendment offered protection to employees who were working to settle the tax disputes. Democrats also raised concerns about whether the amendment would overburden the Office of Personnel Management, which would be responsible for administering the provision. As debate over the provision disintegrated and Democrats called for an opportunity to hold a hearing, Towns pulled both the amendment and the bill from the floor and postponed a vote. A committee source said there was too much “confusion” with the amendment and lingering issues needed to be resolved. “We wanted to take a break to make sure there were no unintended consequences with the bill,” the source said. But, Republicans accused the Democrats of protecting federal employees. Chaffetz said the tax delinquency rate for the Treasury Department — which includes the IRS – -is less than 1 percent, compared to 3.4 percent for the rest of the federal government. He said the government fails to collect roughly $1 billion in taxes annually from about 100,000 federal employees. The committee source said it was not clear if the issues with the amendment would require a hearing or if they could be worked out in a private meeting with the IRS. Imagine that: the very same Democrats who rushed the stimulus through so quickly that not one single elected member of Congress had a chance to read the damn bills, and the very same Democrats who have repeatedly tried to rush ObamaCare through, suddenly have found legislation that requires “taking a break” and “making sure there are no unintended consequences.” An $862 billion stimulus package didn’t require that kind of consideration; a complete takeover of our health care system doesn’t require that kind of consideration; but firing tax cheating government employees is something that must be studied to the nth degree. A 2,700-page Senate health care bill monstrosity can be rushed through by any means possible; but please, oh please let us not rush into getting rid of taxpayer-paid tax cheats. The explanation that Democrats care about all the various nuances of rights that government workers who haven’t bothered to pay their taxes supposedly have is a joke: if they wanted to do anything about these taxpayer-paid tax cheats, they would have wheeled and dealed to get a bill. The simple fact of the matter is that they didn’t WANT a bill. Taxpayer-paid unionized government employees who cheat on their taxes have more money to fork over to Democrats. And the Democrats who would never even consider tort reform because their lawsuit-happy lawyers wouldn’t like it are the very same Democrats who won’t step on their union supporters’ toes. Over anything. You will be hearing about the Democrats “paying” for their health care takeover. Don’t believe it. Again and again and again, Democrats have sold one health care boondoggle after another, claiming that it will “only” cost such-and-so. They have a perfect track record — of failure to live up to their claims. Government programs always exceed their spending estimates. Washington has just run a $1.4 trillion budget deficit for fiscal 2009, even as we are told a new health-care entitlement will reduce red ink by $81 billion over 10 years. To believe that fantastic claim, you have to ignore everything we know about Washington and the history of government health-care programs. For the record, we decided to take a look at how previous federal forecasts matched what later happened. It isn’t pretty. Let’s start with the claim that a more pervasive federal role will restrain costs and thus make health care more affordable. We know that over the past four decades precisely the opposite has occurred. Prior to the creation of Medicare and Medicaid in 1965, health-care inflation ran slightly faster than overall inflation. In the years since, medical inflation has climbed 2.3 times faster than cost increases elsewhere in the economy. Much of this reflects advances in technology and expensive treatments, but the contrast does contradict the claim of government as a benign cost saver. Next let’s examine the record of Congressional forecasters in predicting costs. Start with Medicaid, the joint state-federal program for the poor. The House Ways and Means Committee estimated that its first-year costs would be $238 million. Instead it hit more than $1 billion, and costs have kept climbing. Thanks in part to expansions promoted by California’s Henry Waxman, a principal author of the current House bill, Medicaid now costs 37 times more than it did when it was launched—after adjusting for inflation. Its current cost is $251 billion, up 24.7% or $50 billion in fiscal 2009 alone, and that’s before the health-care bill covers millions of new beneficiaries. Medicare has a similar record. In 1965, Congressional budgeters said that it would cost $12 billion in 1990. Its actual cost that year was $90 billion. Whoops. The hospitalization program alone was supposed to cost $9 billion but wound up costing $67 billion. These aren’t small forecasting errors. The rate of increase in Medicare spending has outpaced overall inflation in nearly every year (up 9.8% in 2009), so a program that began at $4 billion now costs $428 billion. The Medicare program for renal disease was originally estimated in 1973 to cover 11,000 participants. Today it covers 395,000, at a cost of $22 billion. The 1988 Medicare home-care benefit was supposed to cost $4 billion by 1993, but the actual cost was $10 billion, because many more people participated than expected. This is nearly always the case with government programs because their entitlement nature—accepting everyone who meets the age or income limits—means there’s no fixed annual budget. 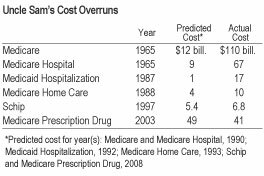 One of the few health-care entitlements that has come in well below the original estimate is the 2003 Medicare prescription drug bill. Those costs are now about one-third below the original projections, according to the Medicare actuaries. Part of the reason is lower than expected participation by seniors and savings from generic drugs. Yet liberal Democrats fought that private-competition model (preferring government drug price controls), just as they are trying to prevent private health plans from competing across state borders now. The lesson here is that spending on nearly all federal benefit programs grows relentlessly once they are established. This history won’t stop Democrats bent on ramming their entitlement into law. But every Member who votes for it is guaranteeing larger deficits and higher taxes far into the future. Count on it. You should notice the bit about the prescription drug benefit passed under Bush, because Democrats have routinely demonized it. They claim that Republicans didn’t even TRY to pay for it, but merely increased the deficit. That is for the most part true, but at least it a) relied upon the private sector to provide the benefit, and b) didn’t socialize the entire economy in the process. Democrats argue that, unlike Republicans with the prescription drug benefit, they are trying to “pay” for their plan. Just as right now I am flapping my arms and trying to fly out of my chair. As much as Democrats want to demonize the Bush prescription drug benefit, it remains the anomaly as being the ONLY government health care program that ran under budget, as opposed to ten times budget. We can’t allow the Medicare system to collapse, as it is on the verge of doing. Too many elderly people who don’t have recourse to anything else are counting on it. But the gigantic hole of red ink is proof that we never should have started this program until we truly counted the cost. Had the government not foisted Medicare upon us, the private market would have solved the problem better. Anybody who thinks we can save one giant government program by creating an even more giant government program is a fool. It is the mindset of one who believes the best way to get out of a hole is to dig deeper and faster. The health care plan that the Democrats are envisioning will be a FAR greater black hole of debt than anything this country has ever seen. Because it is FAR more ambitious, involves FAR more people, and involves a FAR greater takeover of the US economy. And, incredibly, the Democrats are literally using the argument of the skyrocketing deficit to enact something that will massively increase our deficits. Their mindset is the same mindset that deals with our exploding debts by constantly raising the debt ceiling so we can keep on borrowing and borrowing and borrowing. That fixes the problem, doesn’t it? We are facing the largest federal deficits since World War II. That should really scare you, because in World War II, it was AMERICANS who held that debt by purchasing war bonds. Back then, Americans actually saved their money. Quite different from these days, when we routinely go into debt to buy a lot of crap that we don’t need. Today it is CHINA who holds our debt. So as we begin to contemplate the $800 billion a year in interest payments that we will soon be paying, we realize that we are no longer our own masters. If that isn’t bad enough, consider this: at the end of World War II, the United States had the greatest manufacturing and industrial base the world had ever seen. Today, we have only a tiny fraction of that former capability. In addition to being a debtor nation, we are also a “service” nation. You don’t spend your way out of debt; you don’t even service your way out of debt. You produce your way out of debt. We have long since lost the capability to do that. Finally, the debts accrued during World War II were debts that were a) necessary and b) temporary. That, also, is no longer true today. Our World War II debts were the result of our war of necessity against the greatest evil humankind had ever seen; the debts we are experiencing today are the result of our war against our children’s children’s children’s children’s children’s children as we demand more and more benefits at somebody’s else’s expense. As a result of American power following World War II, the U.S. dollar became the fundamental world currency, and English became the official lingua franca of the global economy. Tragically, as a result of the rapid American collapse, the U.S. dollar is now on the verge of being expunged from the global stage, and English is increasingly not being spoken even in America.